Shortly into the fourth year of the railway, on 18 February 1988, delivery was taken of Diesel Mechanical Locomotive DL 3 “Mt Surprise”. The locomotive was loaded onto a tip-tray tri-axle truck at Ipswich Workshops on that morning and unloaded at Kunkala in the afternoon. Loading was assisted by DEL 1174 and unloading proceeded relatively uneventfully at the occupational crossing near Keates’ Dam in Kunkala yards. The road journey must have been the fastest journey DL-3 had ever experienced. After initial checks DL-3 was “passed for traffic” and after brake tests it and C-828 (ex Mulgrave Tramway Car) departed Kunkala at approximately 2pm for cutting 15 (500 metres short of Cabanda). This was the limit of track cleared for DL-3 operation by the Permanent Way Supervisor John McDonald. Driver Nev Spillane and other qualified Rosewood Railway Museum volunteers officiated as cabin crew for the inaugural run. A photo-stop and photo-run were organised for the S bend whilst spirited running up-grade on the long straight (bank 17) was enjoyed by those who were present for this momentous occasion. It was a “massive” piece of traction equipment for the railway at that time. It was built with three others to operate on the Forsayth line. All DL locomotives had names along with the numbers. DL-1 was built some years earlier as the demonstration model. 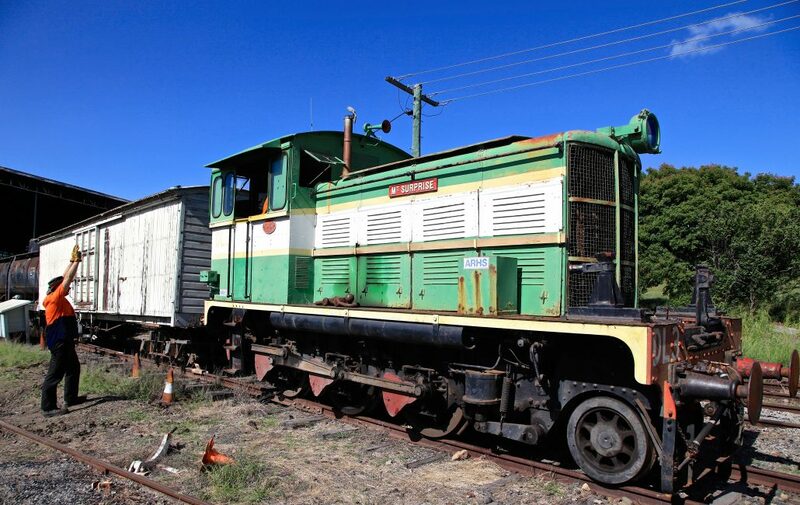 There were only four DL (Diesel Mechanical) locomotives built for QR. Although the whole class was officially “condemned” in 1987, all still are preserved!